“Christian America” is the novel component in Horowitz’s analysis, a term that acknowledges the historical fact that America, at its founding, was 98 percent Protestant. Protestantism, in turn, was intimately linked to the doctrine of “the priesthood of all believers” and to the more broadly Christian idea that all people are created by God. In view of these beliefs and the fact that Protestant groups were living side by side, it followed that in America there would be no institutional or governmental mediator between the individual and God. It also meant that each individual’s rights were endowed solely by their Creator and that freedom of conscience and speech would be hallmarks of the new republic. These examples are picayune compared to the spiteful governmental coercion that’s been employed to force The Little Sisters of the Poor, among others, to violate their consciences thanks to Obamacare abortion provisions. The Supreme Court has been the giant secular lever employed by leftists to fundamentally transform “Christian America” into a state hostile even to a school-girl who joined hands with classmates to give thanks for her food. These politically-motivated “lawyers,” as Horowitz contemptuously labels the high court, began their anti-Christian, anti-Constitutional mission with the expulsion of prayer from public schools in 1962 (Engel v. Vitale). That assault on the free exercise of religion now extends beyond commencement ceremonies and football fields to a bakery that was embroiled in legal battles for years for refusing to provide a celebratory cake for a gay ceremony billed as a wedding — a “crime” made possible by Court rulings against the Defense of Marriage Act and in favor of redefining marriage. The case of Roe v. Wade (1972), which awakened religious conservatives to the fundamental attack on Christian America, is cogently dissected in Dark Agenda, both from a constitutional perspective as well as through the eyes of Norma McCorvey, the anonymous “Jane Roe” who was intentionally deceived and reduced to a legal prop to secure the Supreme Court’s “right to privacy” abortion ruling. (As Horowitz notes, in Marxist thought it’s the grand arc of history and oppressed groups that matter, not mere individuals.) That ruling officially brought about the cultural civil war that for the anti-Christian left involves not simply a virulent hatred of President Trump but also hatred directed toward his supporters who are regularly vilified as Nazis, sexists, racists, homophobes, and “deplorables” who are rightly denied freedom of speech and conscience. Trump’s Oval Office predecessor did his best to stoke these emotions as Horowitz’s litany of anti-Christian comments and actions by President Obama illustrate — from avoiding religious references during a traditional Thanksgiving ceremony to pursuit of a foreign policy that led to the annihilation of the ancient Christian community in Syria. Horowitz ends Dark Agenda with this chilling paragraph reminiscent of Lincoln’s Gettysburg Address: “A nation divided by such fundamental ideas — individual freedom on one side and group identity on the other — cannot long endure, any more than could a nation that was half slave and half free. The urgency that drew the religious right into politics fifty years ago is now an urgency of the nation itself.” Even individuals well aware of the cultural Civil War that now rages in America would do well do arm themselves with the insights in this book — insights that both explain the ideological roots of the conflict and document a host of grievous wounds that “Christian America” has already suffered. Horowitz, an honest agnostic, is doing his best to prevent those wounds from becoming mortal. Richard Kirk is a freelance writer living in Southern California whose book Moral Illiteracy: “Who’s to Say?” is available on Kindle. John Zmirak is a Senior Editor of The Stream, and author of the new Politically Incorrect Guide to Catholicism. 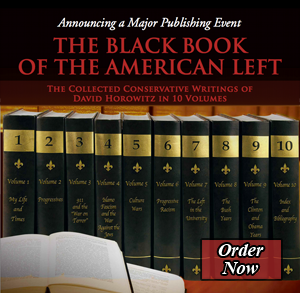 David Horowitz’s new book examines the secular left’s dark agenda. As Horowitz demonstrates in his slim but compelling and disturbing new volume, the left’s ruthless antagonism toward Christianity stems from its own arrogant determination to shape the world according to atheist Karl Marx’s utopian vision of perfect equality and social justice (with Edenic environmental harmony thrown in for good measure). “Those who believe they are changing the world, or saving the planet, or transforming the human race,” Horowitz writes, “are intoxicated with self-aggrandizing pride.” Those afflicted with this arrogance, such as the so-called New Atheists like political comedian Bill Maher, condemn the violence and bigotry spread in the name of religion (especially Christianity; Islam is usually off-limits to condemnation partly because it shares an anti-Western animosity with the left, and partly because open criticism of Islam tends to get the critic targeted for death). But they “are blind to all the positive influences religion has had on human behavior, and they ignore all the atheist-inspired genocides of the last 250 years,” Horowitz writes. He rightly points out that the danger lies not in religion but in human nature; it is our flawed humanity that sometimes poisons religion, not the other way around. In case after case – religious expression in schools, contraception, abortion – the Supreme Court handed down a string of earthshaking decisions founded on the flimsiest and even bogus constitutional reasoning. The unintended consequence of these decisions was to place the Supreme Court on the front lines of an epic culture war. It was not merely a war between left and right, but between secularism and religion, especially the Christian religion. The secular left had discovered an all-powerful instrument – the Supreme Court – with which it could impose its radical, anti-Christian agenda on an unwilling nation. Horowitz also tells the tale of eugenicist Margaret Sanger, a feminist icon who declared in her manifesto Woman and the New Race that women could be liberated from what feminists perceived to be the bonds of motherhood by means of “reproductive freedom,” and may, “by controlling birth, lift motherhood to the plane of a voluntary, intelligent function, and remake the world.” [Emphasis added] Sanger strove to implement her aims by promoting the previously socially unacceptable tools of contraception and abortion. Horowitz describes how, in order to get the Supreme Court to legalize abortion, feminists sought a sacrificial lamb, a woman whose case would be compelling enough to assure legal victory. That lamb was Norma McCorvey, manipulated into serving as the “Jane Roe” of the immeasurably damaging Roe v. Wade decision (McCorvey never actually had an abortion and became an anti-abortion advocate). Today, after eight years of Obama’s relentless castigation of Christian institutions and individuals as bigoted (Horowitz even provides a timeline of hostile acts toward people of Biblical faith during Obama’s tenure), President Donald Trump has been embraced by the religious right despite Trump’s problematic personal character because, as Tony Perkins of the Family Research Council put it, “My support for Trump has never been based upon shared values; it is based on shared concerns.” Predictably, in its obsessive hatred for Christianity and for the upstart political outsider who “stole” the White House from progressive icon (and Saul Alinsky protégé) Hillary Clinton, the left set out to delegitimize Trump by claiming the religious right’s backing is grounded in racism. This critical front of the culture war that has riven our country still rages. David Horowitz’s Dark Agenda is a must-read for every citizen who wants to understand, and to fight back against, the radically secular drift of our country and the assault on America’s core values, traditions, and freedoms. Mark Tapson is the Shillman Fellow on Popular Culture at the David Horowitz Freedom Center.